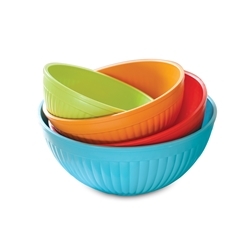 This multi-purpose four piece set includes a 2, 3.5, 5 and 7-quart heavy duty bowls with silicone nonskid bases. Perfect for mixing, microwaving and serving. Bowls nest for easy storage.